Users Worldwide are Visualizing their Minds on their Computers and Mobile Devices for More Intelligent Information Access and Idea Capture. 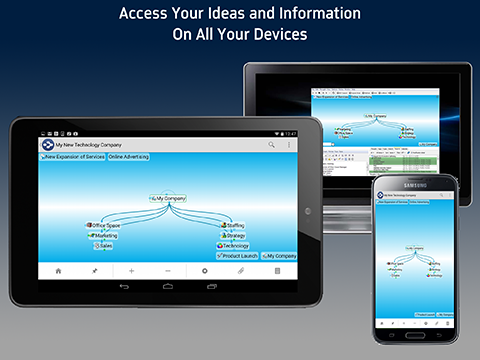 TheBrain offers simple and powerful knowledge visualization for the desktop, cloud and now on Android phones and tablets. With your digital Brain ever-present you’ll never let any of your best ideas get away. TheBrain Technologies, the leading provider of dynamic visualization and knowledge management software, announced its newest release, TheBrain for Android is now available worldwide on Google Play. TheBrain for Android lets users connect all their ideas and information in a way that reflects their unique thought or life projects. What distinguishes TheBrain from other mind mapping or note taking applications is its dynamic data delivery. Clicking or tapping on any Thought in a Brain triggers all related connections so users can see related ideas and get the big picture on everything. 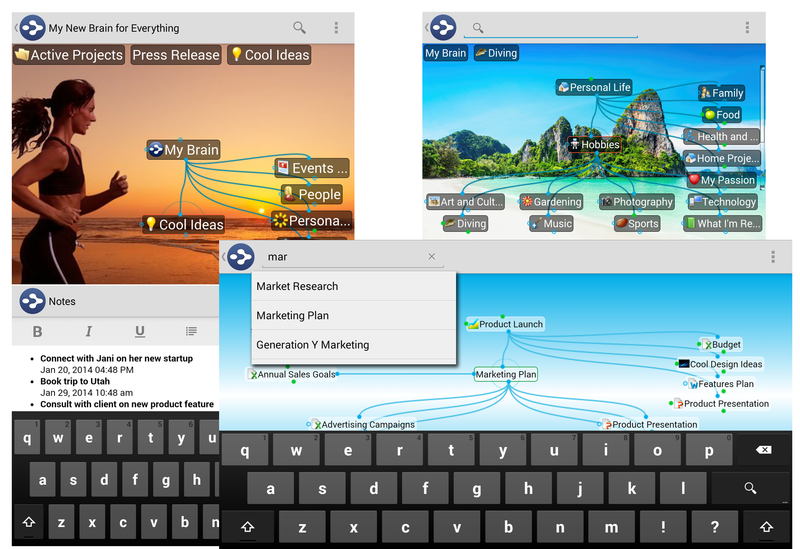 TheBrain for Android works with TheBrain desktop application and users’ Cloud accounts providing universal access to ideas, notes, and files, in addition to visualizing how everything is related. TheBrain for Android is a native app so users can create new Brains, add new Thoughts, take notes, link web pages, and attach photos right from their smart phone and tablet. TheBrain software has been downloaded over two million times and over half of the Fortune 100 organizations use TheBrain for digital brainstorming, project management, and as a complete knowledgebase to find and connect their information. AWARD WINNING VISUALIZATION – Navigate across all key topics and information within your Brain's Thought network and connections. ANDROID, CLOUD AND DESKTOP KNOWLEDGE CREATION – Your Brain can be accessed anywhere. Ideas, notes, links, and files are available on all devices including Android and iOS devices, Windows and Mac computers, and most Web browsers. 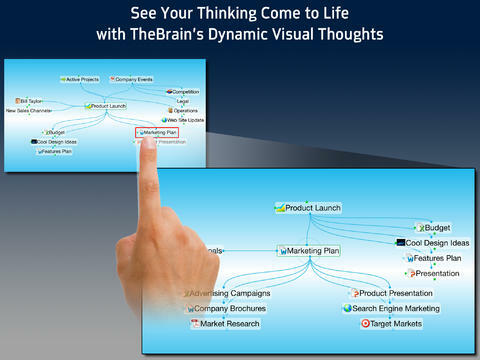 DYNAMIC MIND MAPPING – Move beyond conventional mind maps and linear folder storage with TheBrain’s animated links and visualization that enable any Thought or file to be connected to anything else. EASY IDEA CAPTURE – Just type in a new Thought, make a connection or take a note. Your Brain stores it all. POWERFUL SEARCH – Find any file, web page or idea in seconds. VISUAL FILE MANAGEMENT – Add web pages, photos and documents to Thoughts - All linked in a way that reflects your thinking and business relationships. NO LIMITS BRAINSTORMING AND IDEA MAPPING – See your ideas, make connections and gain new insights in TheBrain’s visual interface. COLLABORATION AND BRAIN SHARING – Publish and share Brains on the cloud. You can even synchronize Thoughts with team members privately. 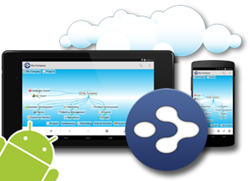 TheBrain for Android is a free app for all Brain users who have a Brain Cloud services account. Users can simply login with their existing cloud services account and all their Brains are right there! Get TheBrain for Android on Google Play. TheBrain desktop application can be downloaded at http://www.thebrain.com. For more information, visit http://www.thebrain.com or e-mail info(at)thebrain(dot)com for more information.